India seems to 'begin' as a country in its northern Himalayan mountains. The great rivers that divide its plains start here as tiny streams. The oldest civilisations of India are thought to have spread from the north. 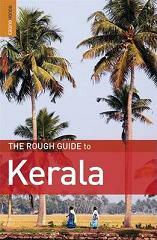 Travel south through India, and the country gradually narrows. There are no longer days worth of travelling either way to meet the coast. At Kanyakumari India finally finishes, surrounded by three of its oceans and there is no land further south until you reach Antarctica. Kanyakumari when we were there was one of the dirtier Indian towns with litter clogging the shore, and deserted buildings crumbling outside of town. It was badly affected by the tsunami of Boxing Day, 2004, and still has a way to go to repair the damage. However, the town itself is lively with its vibrant markets selling sea shells, fish, nuts and fruit. The ancient temple on the sea shore attracts many pilgrims, and there is a feeling of timelessness about the place. Small, brightly painted houses cluster around the harbour, their narrow streets filled with fishing nets. Above the houses are the imposing, pristinely white towers of the beautiful St. Xavier Church. Catholic Church Area The Catholic Church is hard to miss, but surrounding it is a cluster of brightly painted houses in narrow streets that can easily be missed if you do not know they are there! See The Islands Up Close A short ferry trip takes you from the jetty on the shore (down a small road off the steep Main Bazaar street) to the islands visible offshore where the huge statue of Tamil poet Thiruvalluvar stands. 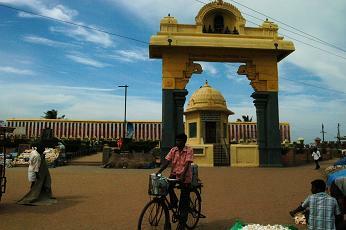 Kumari Amman Temple Situated right on the sea shore, the Kumari temple is dedicated to the virgin goddess Kumari. Inner temple is unfortunately closed to non-Hindus, though the surrounding areas are always interesting and full of activity. Open 04:30-11:45 and 17:30-20:45. Buy a Sea Shell on the Sea Shore Amazing sea shells are sold in their thousands on the sea shore and in the stalls on the main bazaar road (Sannathi St) from tiny snail shells to giant Murex shells. Kanyakumari train station is about 1 km north of the town centre and daily trains depart for Chennai (Madras), Trichy and Madurai. An express service to Trivandrum runs twice a day, which is ideal for onwards travel to Kerala's famous Kovalam Beach resort and quieter Varkala Beach. For an experience that is destined to be unforgettable, the Himsagar Express runs weekly from Kanyakumari to Jammu and Kashmir in India's far north taking 66 hours to complete its south to north journey. If you want to take this journey, consider booking ahead online at IRCTC Reservations. Buses are another option for travel to/from Kanyakumari. The bus stand is a short walk westwards from the town centre down Kovalam Road. On the Main Road/Kovalam Road junction in the town centre is the SETC Booking Office for bus journeys. Kanyakumari Train Station is north of town. The Main Road runs from here in a straight line southwards all the way to the sea at the southern tip (where the Kumari Amman Temple sits). The Police Station and Post Office are roughly halfway between the train station and the sea. East of the Police Station down South Car St is the Main Bazaar area which runs parallel to Main Road towards the sea. In Hindu mythology, goddess Kumari freed the Devas (gods) from capture by killing their captor, Banasura, the demon king. Beauiful Kumari had been sought by Shiva for marriage, but the Devas knew it was only the virgin Kumari that could kill Banasura, and so they tricked Shiva into thinking he had missed the wedding. Kumari waited, and in her despair at Shiva's apparent change of heart, she turned all the wedding gifts into sand and sea-shells, which scatter the coast at Kanyakumari. When Banasura heard of Kumari he too was compelled by her beauty to ask her to marry him. When she refused, he tried to take her by force, at which point she killed him, thus freeing the Devas. 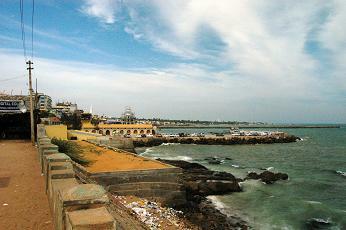 There are numerous hotels in Kanyakumari, it pays to have a look at a few before you decide, since standards vary. There are some clustered around the Main Bazaar. Saravana Lodge is right by the sea, next to the Kumari Temple. Prices range from R.300 to R.500 and the location is good if you want to see early morning activity at the temple. On East Car St, north of the Bazaar by the temple tank, Manickhan Tourist Home offers AC/non AC rooms for R.1200/R.500, clean bathrooms and some good sea views. At the top end on the north side of Main Bazaar street, Melody Parks offers a luxurious stay for R.1200+. We stayed at Hotel Sea Lodge on the Main Bazaar. Rooms are set 3 storeys high around a central courtyard where we could safely park the bike. Very cheap (R.250) but noisy and not too clean, it was nonetheless an interesting stay with the balconies around the inner courtyard doubling up as laundry lines throughout the day. Note that during April/May and the end of October to Jan. it is peak tourist season in Kanyakumari India and accommodation prices tend to increase. Sangham Restaurant on Main Road (opposite the Post Office) has a large menu and its food has influences from all over India. East Car Street is a good place to head if you are looking for an evening meal. You could try the alfresco Archana Restaurant or the slightly more expensive Hotel Sea View. The Main Bazaar area has plenty of fruit stalls and small restaurants, great for dosas in the morning. What is a Dosa? Monsoon: SW Monsoon June to Sept., NE Monsoon Oct. to Dec. Even in the colder months the temperature rarely falls below 20'C. Summers may be uncomfortably hot for some, with average temperatures of 35'C. Want to travel south to north but prefer not to spend 66 hours on the train? Look at the internal flights page to find out about domestic carriers. More ideas for places to explore in Tamil Nadu, India.